To download the .pdf tutorial, click the download-image below! Installing a wireless LAN (Wi-FI) within a business, local community or hotel can produce a new set of challenges you don’t tend to come across in a controlled environment such as a wired Local Area Network (LAN). The purpose of this tutorial is to provide you with information that will help guide you through the process of choosing the right Wi-Fi for your business. In a wired computer network, communication travels over cables. It’s a stable and secure environment. The wireless communications environment is much more complex, not only because of interference, but also because as the user moves the quality of the signal in its intensity improves or decreases. With billions of users, Wi-Fi is a huge technical and commercial success. Users benefit from the compatibility between products, from different manufacturers as well as between different generations of Wi-Fi products. Wi-Fi commonly operates on either the 2.4 GHz band or the 5 GHz band. Offers 3 channels that can be used simultaneously for Wi-Fi. Used by remote controls, Bluetooth and microwaves (frequency gets saturated). Offers 19 channels and allows separate radio communications. Practically reserved for Wi-Fi communications with fewer devices competing for bandwidth than the 2.4 GHz band. Continued improvement in speed with latest 802.11ac WAVE 2 supporting up to 2.3 GB/sec transfer rate as well as MU-MIMO – multiuser multiple input, multiple output which effectively handles more devices while increasing throughput and range. 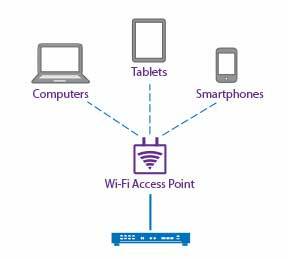 Wireless AP’s connect to a LAN switch allowing mobile users to access to the company’s digital and internal resources from mobile phones, laptop PCs, tablets and other devices. 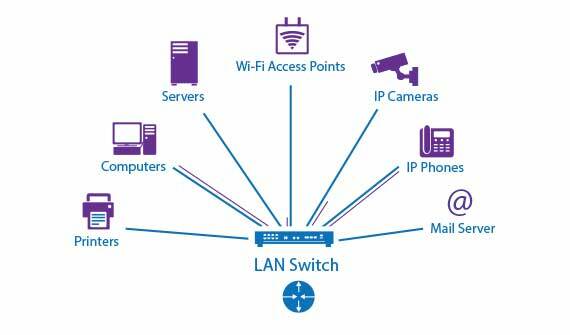 The best way to power an AP is by connecting it to a power over Ethernet (POE) capable port on a LAN switch. This requires the POE LAN switch to have enough power output to support AP’s. A second option is to use local power such as a POE injector. This is suitable if you only have a small number of AP’s to manage. WIRELESS COVERAGE? WHAT TYPE OF ACCESS POINT? A wireless AP covers on average 1,500 sq. feet in a walled office environment (typically drywall). When installed in an open environment or outdoors, coverage area expands greatly to approximately 10,000 sq. feet. These are orders of magnitude that will allow you to estimate the number of required access points and plan a budget. A site survey will determine the number of AP’s needed in your building. Depending on the model, AP’s can be installed inside or outside with integrated or external antennas. The standard AP is designed for use inside buildings; its coverage is concentric. External AP’s can cover large outdoor areas and are resistant to rain, cold and heat. HOW MANY USERS? BANDWIDTH PER USER? The ability of the AP to manage a large number of users will depend on the power of the processor, the number of radios as well as the software quality. You’ll find entry level AP’s that have difficulty managing three users and high-end AP’s capable of managing dozens of users under good conditions. The overall throughput of an AP is shared between all users. The more users the less throughput per user, hence the importance of having high throughput AP’s so that each user has a reasonable rate. ACCESS POINT: SINGLE OR DUAL RADIO? A wireless user-base generally includes different types of devices. It’s, therefore, essential to deploy dual radio AP’s that can send and receive on both frequency bands (2.4 GHz and 5 GHz) at the same time. In equal terms, a dual radio AP will offer more bandwidth than a single radio AP. HOW TO CONNECT TO MULTIPLE WI-FI ACCESS POINTS? A symphony orchestra needs a conductor to coordinate all the instruments. For the same reason, a Wi-Fi network needs a radio controller. This is software that is installed on a separate appliance or integrated in an AP. It ensures that the access points installed in your premises form a coherent and effective Wi-Fi network. With its comprehensive view of AP’s and devices, the controller can detach a wireless device from an AP and force it to connect to a more suitable one. An employee smart phone, tablet or PC is thus always connected to the AP that will offer the best signal quality. The bridge function allows you to connect two separate LANs via Wi-Fi AP’s. If your building is connected to the internet, the wireless bridge feature will connect your two networks and provide internet access to the second building. The distance between the two sites can range from 165 feet to 985 feet depending on the environment; there must be no obstacles between the antennas. You may wish to manage multiple types of users on your Wi-Fi network and give them different rights. For example, your employees have access to all company resources but your visitors only have access to the Internet. You will keep your Wi-Fi for five years on average, so be sure to choose a product that will meet your business needs as they change over that time frame. Choose a dual radio AP that can handle radio pollution problems and support the desired number of users. Pay special attention to ensure compliance with the latest generation of Wi-Fi, 802.11ac. In terms of architecture, a controller ensures quality communication and long-term peace of mind to accommodate future growth. Choose a solution that allows you to manage your Wi-Fi infrastructure from a centralized app. Choose an integrator you trust so that if issues arise with your Wi-Fi network you are working with a knowledgeable and accessible partner. The budget for a new Wi-Fi network will range from about $100 per access point for single-radio device without a centralized controller application. Moving to either a dual-radio AP, or an AP with a built-in controller will start at approximately $300 per access point. For larger installations with AP’s that support dual radio, a virtual or dedicated controller is typically required. A starting budget for a 20 AP installation with a virtual controller is about $7500. These estimates do not include costs associated with wiring or equipment such as POE switches that may be required. Since 1968 Telspan has provided organizations with complete telecommunications solutions. 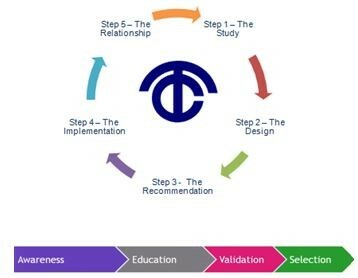 Telspan looks at your business and designs a system that operates the way you need it to. By combining system installation, maintenance, coordination and consultative services, we create a communications solution that fits your business and its changing communications requirements. We are your go-to telecommunications and coordination company. We are a 100% veteran owned business providing complete installation, maintenance, coordination and consultative servies. We work with you to make your business workflow successful. Our passion is building customer satisfaction by providing cutting edge technologies that give clients access to a wide range of tools, ensuring efficient and result-oriented communication solutions. ICON Voice Networks is a leading-edge provider of communications systems, network infrastructure equipment and hosted services specializing in voice, video, mobility, monitoring and alerting. We provide customers highly reliable solutions that integrate voice processing with other office monitoring and notification systems, providing an integrated solution engineered from the core. In addition to development, ICON Voice Networks is a master distributor of IP-PBXs, unified communications systems, hosted voice services, network switching and routing and wireless LAN technology. Serving a growing community of over 250 authorized re-sellers ICON offers the highest level of technical support, sales support and implementation services in the industry. For more information please visit www.iconvn.com. Alcatel-Lucent Enterprise (ALE) is a leading provider of enterprise communications solutions and services, from the office to the cloud, marketed under the Alcatel-Lucent Enterprise brand. Building on an established heritage of innovation and entrepreneurial spirit, ALE operates globally with 2700+ employees in 100+ countries worldwide, with US headquarters in Calabasas, CA and world-wide headquarters located near Paris, France. For more information visit http://enterprise.alcatel-lucent.com/. If you are interested in finding more details about what Wi-Fi solution will best suit your business visit our website at www.telspansolutions.com or all us at 860-761-1411.